My husband rewrote a certain song by Sir Mix-A-Lot to discuss the issue of iPad Photography. Inspired by the abundance of spider lilies this year, I did some research and found out an interesting piece of Japanese folklore that got me thinking. i ordered the creepiest unicorn mask on amazon. and now my family can't stop ourselves from taking stupid pictures with it on. I'm going with the memory of standing in front of the church with my dad when he had "color guard" duty to make sure nobody of the wrong color tried to worship with us. And the one the next day about how, despite that, we were practically liberals compared to today's fundamentalists. Fall is upon us & while cooler weather & pretty leaves are wonderful, cold & flu are not! I share an easy home remedy! 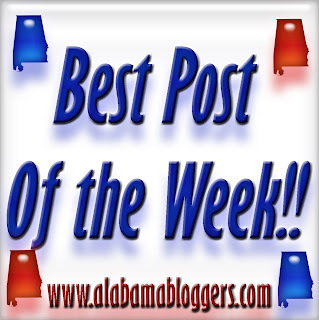 On The Dairyman's Blog, the story of a question I'll never forget being asked at the 1990 West Alabama Fair. Ever heard of a "Dirty Diet Coke?" Well. it's my new vice that reminds me of home! Giving away one cook book per month. This is the first giveaway. I picked this one b/c of the artwork. A new direction for me. I hope to do more. My husband, dogs, and I went hiking at Oak Mountain for the first time ever last weekend..
15. Media of Birmingham - My site got banned and then unbanned from the state's largest website. But why? 16. Wade on Birmingham - Who won in Tuesday's runoffs? 17. Birmingham Blogging Academy - Hashtags have been mocked and abused, and with good reason. But we can still benefit from them. 18. Y'all Connect - Expert advice on building business relationships through social media. The hubs and I found some items while thrifting. I share a big transformation and some little bits I plan on re-using as well. My post isn't my usual lightheartedness this time.